Yes, we know that one image is worth a thousand words. But we also believe that a nice story could really augment the impression from your photograph. Maybe there's a little detail on the picture that visitors of your profile might miss when they quickly scroll through your gallery. Or there was something special about how you made a shot. Or you would like just let people know about the place and time of the capture. This really helps the viewers to value your work and it also makes the photo page look awesome. But there are also great benefits that are not obvious, so we wanted to let you know about them. All of them are about making yourself more visible and get the attention that you deserve for your creative works. First, it's the SEO. Everything that you write in photo's description will be indexed by search engines. It means that people will be able to find your page organically when they search for something that you write about. And every photo in your portfolio has its own page, so with every described image you greatly increase your chances to be found. 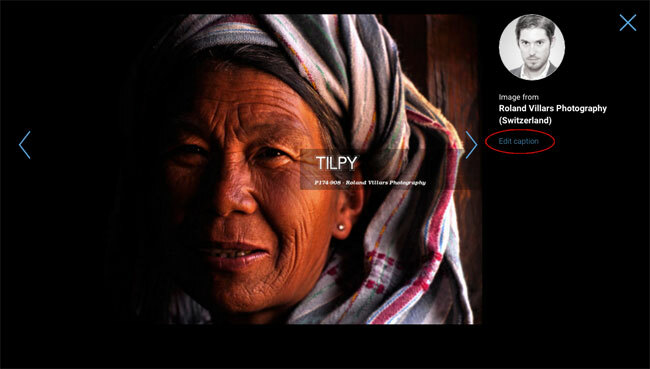 Second, the Tilpy content promotion. We love our handpicked community and work hard to get attention to the best works that are published on the platform. Every day we find awesome images and share them in our socials media channels. Needless to say, with all the credits to the authors and links to their own social media accounts. This means that our featured photographers get visitors from Twitter, Instagram, Facebook and Pinterest, and grow their following through that. We are also active in the most popular social network in Russian speaking world, VK - so, your photos might be admired even by the people that don't speak your language! Even though the image itself is the most important part of our post/tweet/pin, providing a caption increases the chances of your photograph being selected for the promotion. On top of that, since this week, we compile our own collections of great imagery uploaded by our artists. There're so many incredible photos out there that we decided to guide visitors of our site to the works of different artists, united by the same topic. It's like combining several stories into one small photo-enriched book. And the better the story is, the more probable is its place in a Tilpy collection! 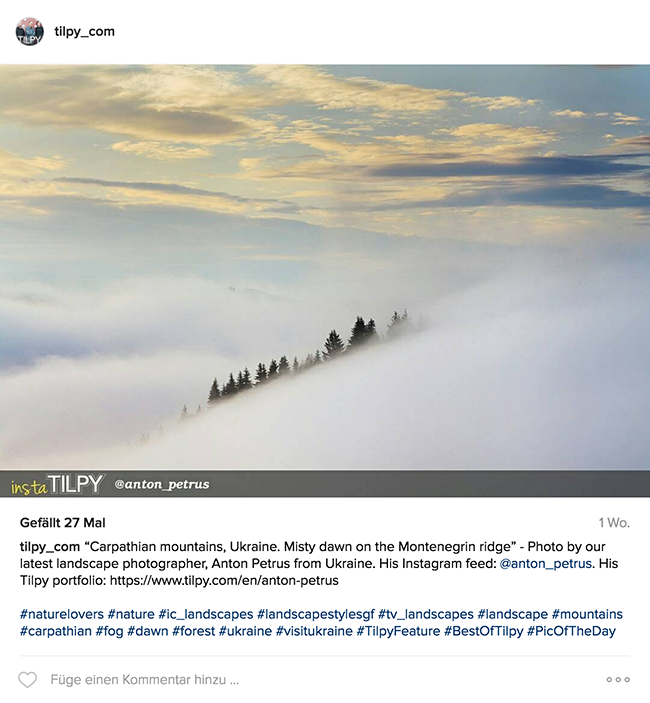 Well, that was a lot of words, but we hope they persuaded you to log into your Tilpy account and name and describe your photos! It's actually pretty easy, as you can enter your texts in several ways. It works the same way for your marketplace photos (those ones that you submitted to Tilpy projects). Actually, if you have ever uploaded photos to our projects (and if not, you should, as it can bring real money for your work! ), you have already seen the comment field on the form where you accept license terms and provide model/property release. But from now on, you can also edit both name of the photo and its description, and you can do it at any moment after you have already uploaded a photograph. 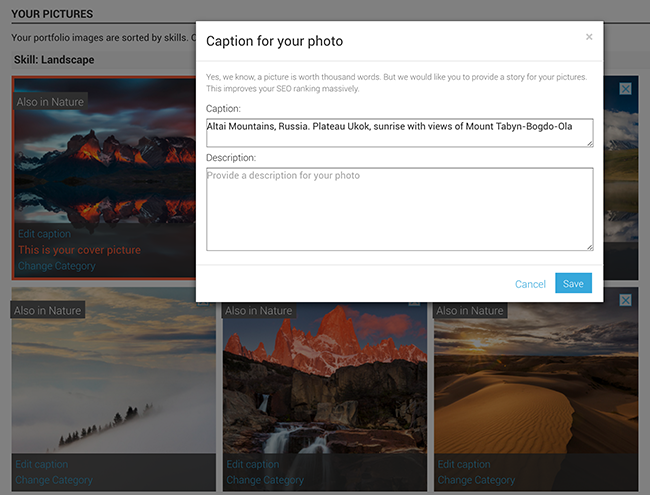 Finally, you don't even need to be inside of your profile editor to add captions. 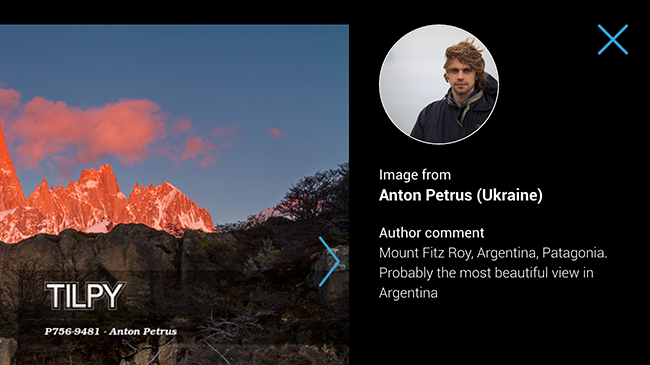 You can go to any of your publicly visible photo pages, and there you (and only you!) will see the link for editing the caption. So you can browse through your gallery in all its glory and edit the captions right away. Another advantage of this method is that you will immediately see how much cooler it looks. We are looking forward to read your stories and share them with the community!